Whether you're a veteran duck hunter or have yet to shoot your first duck, layout boat hunting is a completely different way to experience duck hunting! 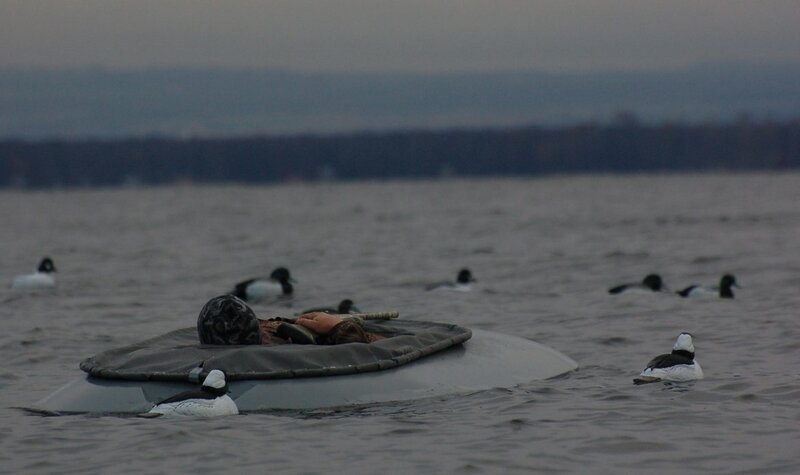 Laying just inches above the surface of the water, in a sea of decoys, as redheads, bluebills, goldeneye or even long-tailed ducks come low and fast across the water, then jam on the brakes and put their feet in your face... Boom! You'll be hooked! We have both 1 man and 2 man layout boats that help us meet the needs of most groups. Typically only 2 hunters are hunting at a time, while other hunters in the group wait their turn in the tender boat. We rotate hunters in and out every 45 minutes to an hour to ensure that everyone in the group has good opportunities and can experience the thrill of this unique style of hunting. This is also why we need to keep the groups small. Bluebills, bufflehead, ruddy ducks and goldeneye are usually the first to arrive in mid-November, followed by redheads, long-tailed ducks and white winged scoter in late November. We also get the occasional canvasback and ring neck, but targeting these species in our area isn't typically possible. When planning your trip, always take into account that we cannot predict the weather or migration, so although we only offer our hunts during historically prime times in the migration and will make every effort to provide you with a safe, fun hunt full of opportunities to harvest ducks, it is hunting and we are at the mercy of Mother Nature. If you will be coming in from out of town to hunt with us, booking a couple days is recommended just in case you end up with a bad weather day or two. 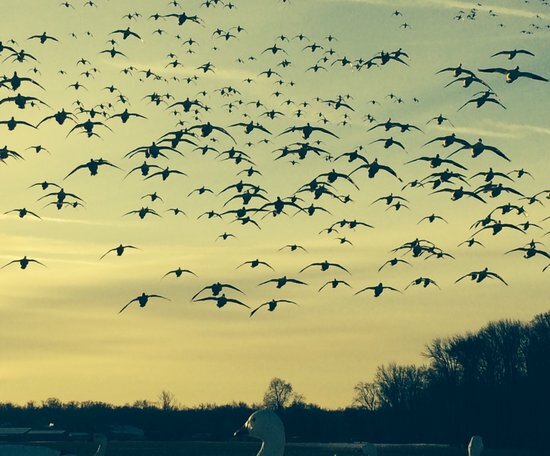 A spring snow goose hunt is something that should be on every serious waterfowlers' bucket list. Aside from the actual hunt, its amazing just to see the ducks, swans, Canadas and other migratory birds headed back north during the spring migration. However, we don't care if you're a serious waterfowler or not - we're out to put you under the snow geese and have fun. Most of our hunts will be over a large spread of GHG fullbody and Sillosock decoys, between 1,000 and 3,000, set in a field along the migration path, highly visible to hungry and tired snow geese heading north on their spring migration. There will be multiple custom built e-callers playing tempting calling sequences and motion decoys dancing throughout the spread to ensure the migrating geese know we're the place to be. You just never know when migrating geese are going to come through, so we hunt all day and supply a hot lunch in the field, so you don't miss any action. Here in the Atlantic Flyway the majority of our snow geese are the greater subspecies with a population of around 1 million, so if you've experienced the Central Flyway's lessor snow goose and Ross goose migration, we're on a much smaller scale, but that's not to say the action can't be just as hot or hotter from time to time! We do get some lesser subspecies snow geese, both white and blue color phases and on the rare occasion, we will get Ross's geese. When planning your trip, always take into account that we cannot predict the weather or migration, so although we only offer our hunts during historically prime times in the migration and will make every effort to provide you with a safe, fun hunt full of opportunities to harvest geese, it is hunting and we are at the mercy of Mother Nature. If you will be coming in from out of town to hunt with us, booking 2-3 days is recommended just in case you end up with a bad weather day or two.